Two Middlesex University lecturers in the School of Law have contributed to a groundbreaking new book that engages with key areas of law using comic material. Dr Angus Nurse and Dr David Keane have both penned a chapter in Graphic Justice: Intersections of Comics and Law edited by Thomas Giddens – one focusing on vigilantism and the other on human rights. In Dr Keane's chapter with his former Middlesex colleague Dr Jérémie Gilbert, he draws upon the work of 'graphic reporters' such as Joe Sacco and Jean-Philippe Stassen, whose graphic novels have reported on real-life conflicts such as the Bosnian War and Rwandan genocide. "As a cartoon enthusiast and French speaker, I'm very interested in bande dessinées ('drawn strips') from France and Belgium," says Dr Keane. "Comics are a big part of the culture in those countries, but there are many people who believe cartoons aren't a serious enough medium to cover conflicts, war tribunals and human rights violations. "However, illustration can bring to a real added value to these stories in terms of the visual impact of the imagery and the additional pieces of contextual information you can communicate across a cartoon strip by juxtaposing scenes that happened at different times." 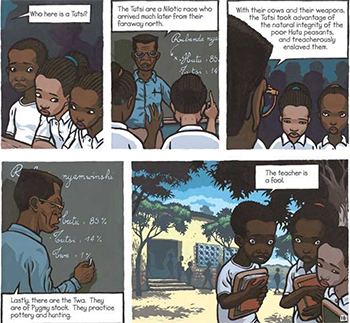 You can read a fascinating summary of Dr Gilbert and Dr Keane's chapter, 'Graphic reporting: human rights violations through the lens of graphic novels' on Middlesex University's experts' blog mdxminds.com. Image: An English translation of a strip from J. Stassen's Deogratias: A Tale of Rwanda. All rights reserved.